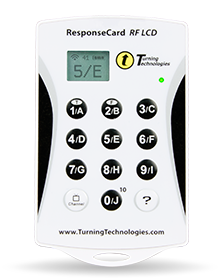 TurningPoint clickers are supported by LSU and used in classrooms all across campus. You answer questions in private – no need for you to raise your hand and be called upon. The answers are collected almost instantly. This allows you and your instructor to make efficient use of your time together in the classroom. The system (TurningPoint) will give a summary of all the answers submitted after the question ends, giving you and your instructor valuable and immediate feedback. With this feedback, your instructor will know what points need more discussion and explanation, and which points are understood. ALL STUDENTS using clickers must purchase a TurningPoint subscription. Please see the article below (Purchasing & Registering a Clicker/Subscription) on how to purchase a subscription and/or register. Purchasing & Registering a Clicker/Subscription - When signing up for an account and registering your clicker, it is crucial that you use your own Moodle account to register. If you use someone else's account, then it will not set up correctly on your Moodle account. If you have questions or need further assistance, please contact the Service Desk at 225-578-3375 (578-DESK).